Tag Archive | "Siamese Tigerfish"
New Guinea Tigerfish (Datnioides Campbelli) are also known as Campbell’s Tigerfish, Freshwater Tripletail or just Tigerfish by tropical fish keeping enthusiasts and are one of just five species of Siamese Tigerfish (Indo-Pacific Tigerperches). New Guinea Tigerfish are found in the brackish water river mouths, the river waters that are beyond the influence of tidal changes, and the coastal lagoons of Indonesia and Papua New Guinea. They are quite common in the Fly, Oriomo, and Lorentz rivers where they are also considered a food source. The New Guinea Tigerfish is a beautiful carnivore that is rarely available to tropical fish keeping enthusiasts. 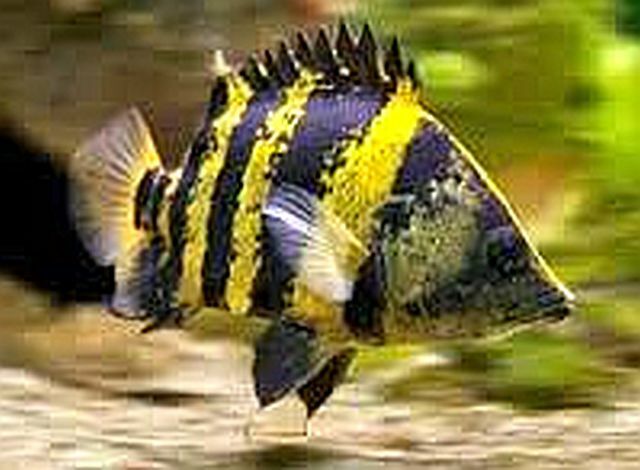 Datnioides Campbelli have a gold base body color with five or more indistinctly edged vertical black bars and irregular black spots covering the flanks. The heads of the adults are black but can appear greenish in color, and the body color can become extremely dark, especially in stressed specimens. The sexes are indistinguishable from each other. New Guinea Tigerfish grow to over 18″ in length and require a large tank of at least 100 gallons or more to provide them with ample swimming space. They prefer subdued lighting and should be maintained in a brackish water or medium hard alkaline freshwater environment to keep them healthy. driftwood and river rock can be used to aquascape their aquariums. 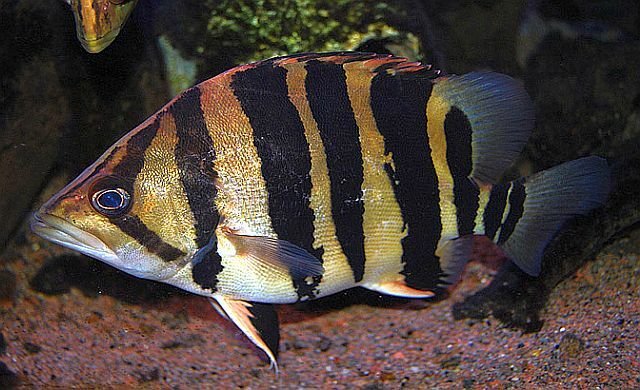 They can be kept with other large non aggressive species as well as other species of Datnioides tigerfish but they can be territorial and aggressive towards others of their own species and fish small enough to make a meal of. They can be kept in a single species tank as juveniles, but as adults they usually become aggressive towards others of their own kind. New Guinea Tigerfish have never been bred in an aquarium environment and little is known of their breeding habits. Datnioides Campbelli are predators but can be taught to eat dead meaty foods. Whitebaits, mussels, shrimp, prawns, ghost shrimp , krill, bloodworms and live earthworms can all be fed to juveniles as well as adults. The New Guinea Tigerfish is rarely available to tropical fish keeping enthusiasts and is usually very expensive at any size when they are found.